I loved my Surface RT from the beginning. The reason why I preferred the Surface RT over the Surface Pro was that the Surface Pro was too small for me as a Notebook, and too heavy as a tablet. So I was always the Notebook+tablet-guy, and not the one-device-for-all-guy. But you know, this might change with the Surface 3. Ok, now to this story. When I bought the Surface 2 (RT) last year, my Surface RT was a bit unused, as the new version was more light-weight and faster. But I haven’t sold my Surface RT, cause I think it’s still an awesome device. My wife and our kids also loved that device, especially for viewing family-pictures, but they also preferred my new Surface 2. So the Surface RT was a bit unused these days. But since 3 months the Surface RT is again the new superstar in our house. Cameras should have infra-red-support for night vision. I asked an electrician for an offer. But it was just too expensive, and additionally he said he needs to slit some walls, which would cause even more costs as additional work is needed to fix all that. Beside those points my “Nerd”-adrenalin was increasing with every day while I was thinking about my requirements. And so I came up that this project is a totally great project for me – just for me (and you, my faithful blog-reader). So I planned to do the whole stuff on my own. 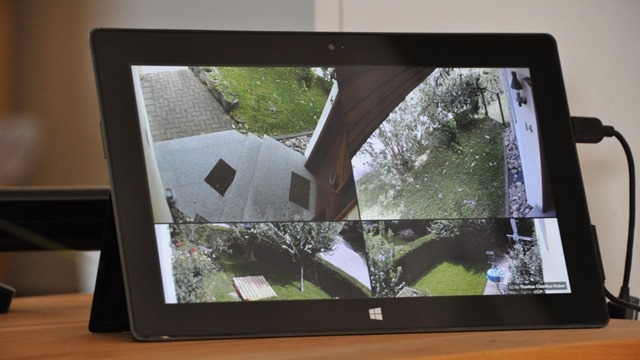 After I looked at the footprint of our house intensively, I planned to install 7 IP Cameras. That number of cameras is necessary to see every area around our house. I drilled holes, crimped RJ45 network cables (yes, I didn’t want to use WiFi for that project. Reason is just to keep electric smog as low as possible), branched off additional plug sockets etc. In the end I had the seven cameras connected to my home network via ethernet-switch. The picture below shows this. After I had installed all cameras, I wanted to have a central point in our house where anyone could view them all. Especially the camera at the front door. And that’s where my Surface RT came into the game. 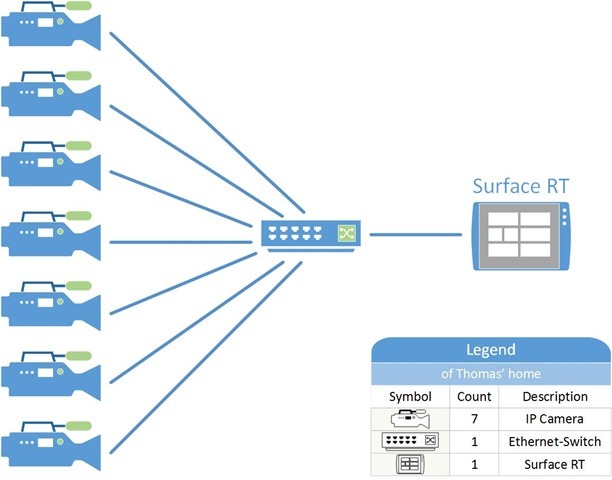 I connected the Surface RT also to the same network the IP cameras are in, like shown below. Clicking on one Camera-image will zoom it up to 100% of the screen (of course with a nice animation). In addition I added a USB-to-Ethernet-Adapter to the Surface RT, as we’re turning off our WiFi during the night. But of course the device should still run. My provider gives my only a physical IPv6-address, but no physical IPv4-address. This is called Dual-Stack-Lite (more here on Wikipedia). When I call an IPv4-server, that call goes in the first step via IPv6 to a proxy of my provider, and from there with a physical IPv4-address to the target host. Unfortunately that IPv4-address is shared with many other users. I never noticed that while I was using the web as a client. But now I wanted to serve the camera-images from my Home-Network. First trial was to do a Port-forwarding on my Router to the IP-Addresses of my cameras. But the problem is, I don’t have a physical public IPv4-address. My IPv4-address is shared with many other users, and it’s the address of the proxy. 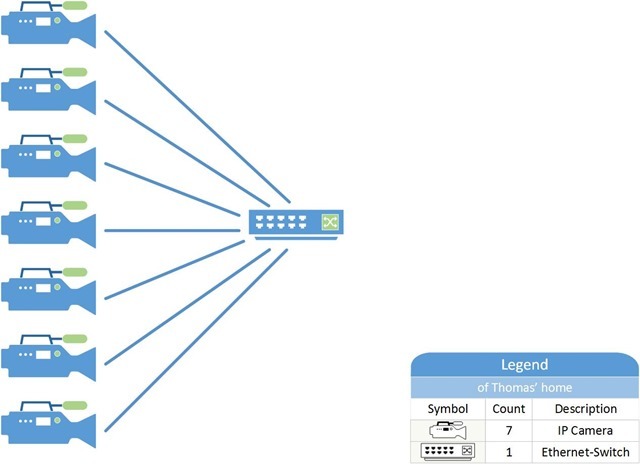 I’m not able to reach my home-network with IPv4, the call will end at the proxy! Ok, so only IPv6 will work. Second trial was to use IPv6. But then the next problem popped up. The whole mobile communications network in Germany (and also in other/most parts of the world) runs still with IPv4. So to access IPv6-stuff from my mobile, I need to go through another proxy that does the translation from IPv4 to IPv6 and back. Puh, what a mess. When you read in forums about private NAS (Network attached storage)-systems, you’ll find a lot of that IPv4/IPv6-stuff. But I didn’t like the existing workarounds, and I came up with another idea. Yes, due to the IPv6/IPv4-issue, I’m not able to access my Home-Network from the Internet in an easy way. But I can upload things from my Home-Network to the Internet. So I had the idea to upload compressed images from my 7 cameras every second. So I need a service that does that job. As I already had a 24h/7days-running-Surface RT-device, I thought maybe the Surface RT could do that job in addition – beside displaying live-images of the 7 cameras. But where shall I put those images? For me Microsoft Azure seems to be the perfect place. I could create a secure Azure Website or any other client. As the camera-images are very small, I thought Azure’s Blob Storage would be a bit overkill for that scenario. So I decided to use Table Storage on Microsoft Azure. I created a simple table that contains the current images of all seven cams. And my Surface RT uploads those images every second. And guess what: My Surface RT does this job without break since three months. And everytime we’ve a visit in our house, people say: “Wow, how crazy is that”. And they think the Surface RT is just displaying a live-view of the cams, but you know now, it’s doing more. Now I’ve all my current camera-images available in Microsoft Azure. So I can do whatever I want with them. I decided to create a Windows Phone App just for me. 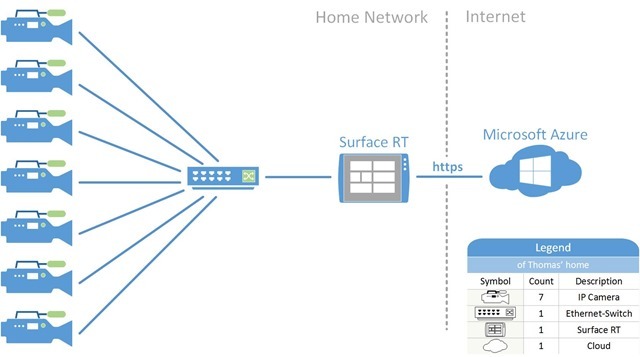 So I can connect with my Windows Phone to the fresh data on Microsoft Azure that is provided by the most reliable server in our house, the Surface RT. The image below shows the final architecture. Alright, after a break when I bought the Surface 2 my Surface RT is used again and more than ever before. And everyone in our house is loving it. Today even my youngest daughter (1,5yo) runs to the Surface RT when the doorbell rings to look who’s waiting behind the front door. yes, there is. A small one, but I have one. Anyway, thanks for the hint. Could you share your windows RT and windows phone apps that you used? I still need to polish them a bit, as I’ve hardcoded my Azure-Keys etc. this is pretty cool application. Congrats!. 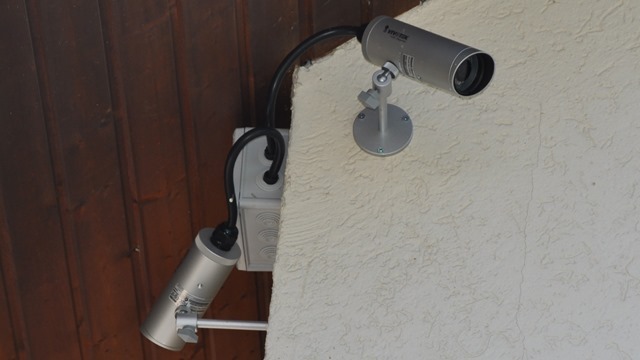 I’ve been searching for a similar solution with out too much succcess (tried dropcam but didn’t like it and they don’t take non-us clients). Do you think you can share the code for the surface RT and the windows phone app? 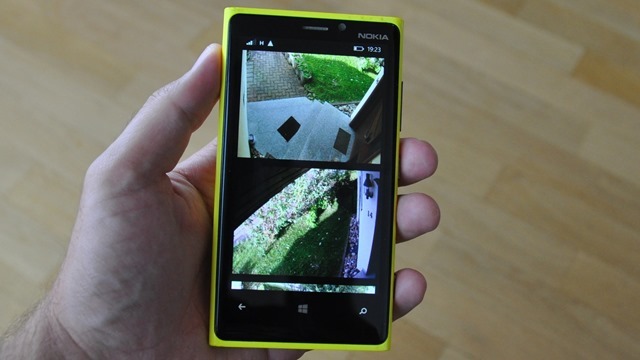 Your RT could do that, and send you a message if it detects motion outside your house. That is one cool setup, and what great reuse for your Surface RT! I’m setting up two cameras in my condo (WiFi) and using a WHS server to monitor and record on motion detection. Not nearly as cool as your setup, but it’s fun tinkkering with that stuff! Really cool! I need to do something like that. That is an epic solution! An excellent setup you got prepared! Hi Thomas! This is a amazing! I’m in the same boat looking for surveillance system and nothing satisfies me until I saw your article. Would you mind sharing some love in Reddit as well? no, the app is not available for purchasing. It was too much effort to support several cameras. If you’re a developer, you might be able to do it yourself by using the MJPEG-Stream of your camera, which is quite simple to read. unfortunately no code snippets available for this. Never found the time to polish it up and make it cam independent. I am trying to do this exact thing with an old Surface RT laying around. I have 8 cameras and would like to use the RT as a viewing point for all the cameras. Any suggestions on how I can do that? Even if it’s not ‘polished’ I would still like to be able to get something that kind of works. Hi Antonio, what cameras do you have? If they support an MJPEG-Stream it’s quite simple. Get that stream, grab the images and display them in an Image element. This is how I did it.